Color me sentimental and old-fashioned... but this segment moves me very deeply. 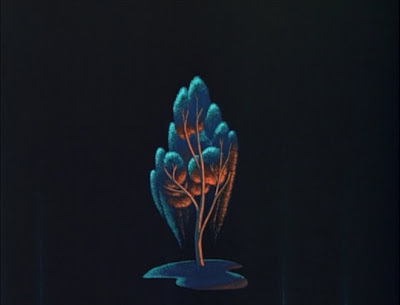 The classic Joyce Kilmer poem TREES received a beautiful musical setting by composer Oscar Rasbach. From that, Disney's version received an orchestration which was incredibly lush, with a storm segment added in the middle. The final touch was beautiful vocals by "Fred Waring and the Pennsylvanians." Probably most blog readers are too young to even recognize that name. But as a very small child in the 60s, my parents took me to a Fred Waring concert. Mr. Waring was a great vocal conductor, and "the Pennsylvanians" were his singers, his choir. Rarely will you hear a choir sing with such intensity, nuance and feeling. Nearly every word receives special phrasing. 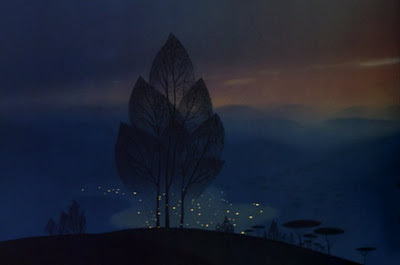 These images are from the background art in TREES by Mssr's Disney and Waring. In a world where much of what passes for "music" is angry, lacking in melody, and colorless, TREES is refreshing in its unbridled nostalgia. Once upon a time, listeners actually embraced beautiful words and melodies, thrilled to lush harmonies, and music and art strived to move the heart. It was a simpler time. And that, I think, was a very good thing.